The C&A RR consists of two independent outdoor train layouts, with trackwork and trains maintained by Chuck Dollins and landscaping and structures by Anabeth Dollins. 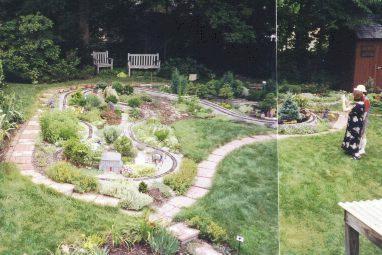 There is a G-gauge layout, begun in 1995, consisting of about 200 feet of track laid out in a single serpentine loop on the ground. Chuck has run live steam as well as electric engines on this layout. 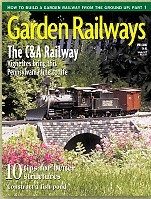 This layout was featured in the April 2000 issue of Garden Railways magazine. Plants in the layout include varieties of thyme, sedum, conifer, and boxwood. There are miniature versions of azalea, iris, baby's breath, chrysanthemum, and hosta. A large collection of other flowering annuals and perennials is kept well-trimmed by The Rabbits, local de-landscapers. There are four kit buildings and a gazebo. Scratchbuilts include two styrofoam buildings, two jigstone buildings, two bridges (see cover photo above), and a pavilion with furniture. Ongoing excavation in the layout is provided by The Chipmunks, a local deconstruction firm. The No-Straight-Track O-gauge layout, begun in 1999, is a spectacle-shaped raised loop of about 100 feet of stainless steel three-rail track. There isn't a single piece of straight track in the layout. The Pendon Museum in Oxfordshire, England. An incredibly detailed HO layout. Bekonscot Model Village in Buckinghamshire, England. An acre and a half of trains, scale buildings, and gardens.